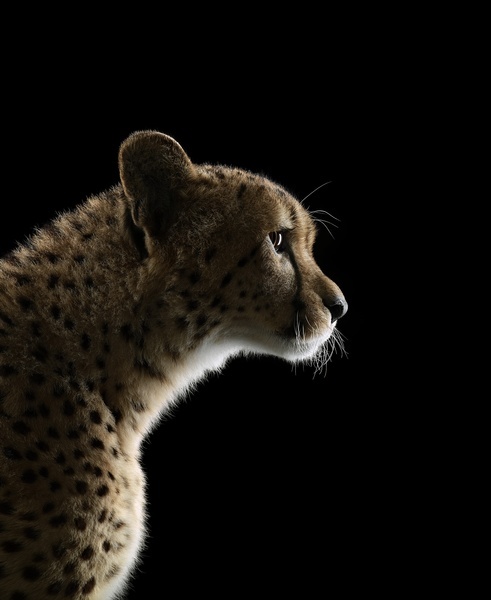 photo-eye Gallery Behind the Photo: Brad Wilson – Cheetah #2 In this Behind the Photo segment, Brad Wilson describes the charming yet challenging circumstances he faced while making Cheetah #2, Los Angeles, CA, 2011. " Cheetah #2 is currently on view in Wilson’s exhibition AFFINITY running through February 4th, 2017 at photo-eye Gallery. In this Behind the Photo segment, Brad Wilson describes the charming yet challenging circumstances he faced while making Cheetah #2, Los Angeles, CA, 2011. Cheetah #2 is currently on view in Wilson’s exhibition AFFINITY running through February 4th, 2017 at photo-eye Gallery. "This male cheetah I worked with in 2011 came from a sanctuary in northern California. He was a beautiful animal - regal and relaxed, but, unfortunately for me, he was a fairly reluctant model. Most cats are. After a lot of patient waiting, and many raw chicken legs, he decided to cooperate for a few fleeting minutes. This image of him was the only profile I captured during our time together, and, luckily, he was looking right into the light. However, this was not my most memorable moment with him. Once, while adjusting some equipment on the photo set, I felt something extremely rough and warm moving across my skin. 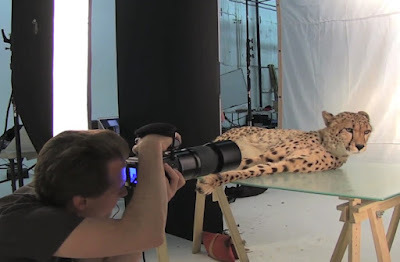 It startled me at first, but when I looked down I saw the cheetah calmly licking my arm. I just allowed him to continue, fully aware that this was probably a once-in-a-lifetime experience. This particular cheetah was safe and well-cared for at his sanctuary, but the wild members of his species are not so well off. An international team of researchers from organizations like the Wildlife Conservation Society, the Zoological Society of London, Panthera, and many others have recently discovered that cheetah populations are declining precipitously across Africa and Asia. By current estimates, there may be only about 7000 cats left. My photograph has been used by various conservation groups to help call attention to the cheetah’s plight and inspire action. I hope future efforts yield positive results so the world doesn’t lose this truly majestic creature." On Saturday, February 11th Brad Wilson’s prices will increase. This is great opportunity to collect work from the AFFINITY series in its current pricing structure. Wilson in the studio with Cheetah #2, Los Angeles, CA, 2011. For more information, and to purchase prints, please contact the gallery at 505.988.5152 x 202, or gallery@photoeye.com.